Hay House Inc., 9781401955021, 192pp. Mike Dooley, the beloved creator of Notes from the Universe, distills a career's worth of inspiration into elegant, brief lessons for making our way through the world--conceived as a guidebook for his young daughter to read when she grows up, yet relevant to everyone who's living a life on earth. Mike returns with his most impactful book yet: a volume of almost 500 insights drawn from his 20+ years as a New Thought leader, organized between endearing letters that recall poignant moments of fatherhood. Through books, courses, and live events, Mike has engaged students with his trademark humor, wisdom, and sheer joy in living. He speaks of understanding our innate spirituality and personal responsibility as the means to unlocking our power over the illusions of time and space. 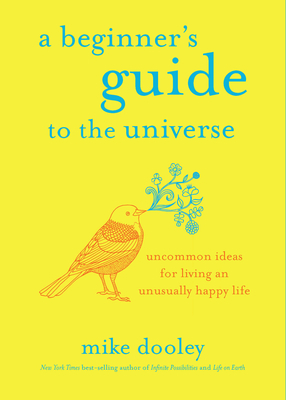 A Beginner's Guide to the Universe is filled with gem-like bits of wisdom imparting his most essential, heartfelt advice about living deliberately and creating consciously--comparable to such treasures as Life's Little Instruction Book, The Prophet, and The Things You Can See Only When You Slow Down. Cleverly guiding the reader through a range of topics--including family and relationships, power and responsibility, adversity and rebounding, even the nature of heaven, angels, and God--Mike succeeds in making a happy life in this universe seem easily within our reach. The short passages of text placed artfully on each page, in a book that's a pleasure to hold in the hand, make this an ideal gift for a parent, a parent-to-be, a child, a new grad, a dear friend, or anyone who needs a dose of Dooley, whether they know it or not. Mike Dooley is a former PricewaterhouseCoopers international tax consultant turned entrepreneur. He's the founder of a philosophical Adventurers Club on the Internet that's now home to more than 750,000 members from almost every country and territory on earth. His inspirational books emphasizing spiritual accountability have been published in 25 languages, and he was one of the featured teachers in the international phenomenon The Secret. Today Mike is best known for his free "Notes from the Universe" e-mailings, social network postings, and his New York Times bestsellers, Infinite Possibilities: The Art of Living Your Dreams and Leveraging the Universe: 7 Steps to Engaging Life's Magic. He lives what he teaches, traveling internationally to speak on life, dreams, and happiness.